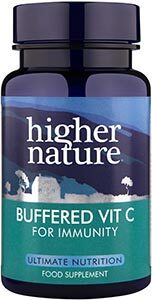 We’ve used quality, whole food ingredients to create our True Food Vitamin C supplements. This unique formulation is designed for optimal absorption, using a natural form of vitamin C that is not only already recognised by the digestive system, but works in synergy with other vitamins and minerals for a more diverse range of benefits. From boosting the immune system to helping reduce tiredness and fatigue, True Food Vitamin C is ideal for supporting a busy lifestyle. I have used 5 packages of this supplement and will continue to use it. Haven't been ill for quite a while.